Today Northern Ireland has largely put the horrors of the 30 years of “The Troubles” – in which over 3,500 died – behind. But politics remains deeply divided on religious grounds and sectarian tensions over issues such as flags and parades have erupted into riots and disorder over the last couple of years. The 1998 Good Friday (or Belfast) Agreement, the 2006 St Andrews Agreement, the 2010 Hillsborough Castle Agreement all played their part in ending conflict and developing Northern Ireland’s unique and wide-ranging devolution settlement. This requires all five main parties across the unionist and nationalist spectrum to work together in coalition government – the equivalent at Westminster might be a coalition of Conservative, Labour, Liberal Democrats, UKIP and Greens. To function effectively, parties who were bitter enemies have to work together. 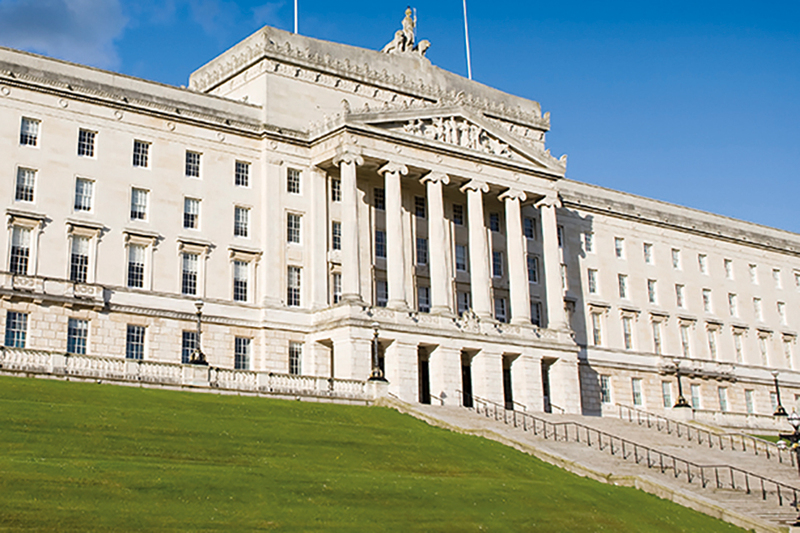 The restoration of devolution in 2007 began the longest period of devolved government in Northern Ireland since the old Stormont Parliament was dissolved in 1972. But, by the summer of 2014, severe stresses were showing and devolution was under threat. Key decisions were gridlocked and Northern Ireland Ministers seemed unable to find a way forward. The Northern Ireland parties had been trying, as yet unsuccessfully, to make progress on long-standing “legacy” issues. The flying of flags, regulation of parades, and how to come to terms with Northern Ireland’s past of conflict were unresolved, but had become the source of tension and sometimes disorder. Added to these, were an urgent budget problem and significant political differences over the introduction of welfare changes. An overspend in 2014 and no agreed budget for 2015 threatened chaos and collapse of the devolved institutions. In September, the First Minister, Peter Robinson, called for fresh comprehensive talks involving the main parties and the British and Irish Governments. So on 28 September, the Secretary of State for Northern Ireland, the Rt Hon Theresa Villiers MP, announced such talks would be convened, to start a couple of weeks later. Having shed most of its responsibilities and many of its staff on devolution, the Northern Ireland Office faced the immediate challenge of how to support such talks. Expectations, after previous failures, were low but a lot was at stake. It was clear the Northern Ireland Office could not work in isolation – success could only be achieved in close co- operation with the devolved Executive, and the members of the Northern Ireland Civil Service (NICS) who work for it. So Malcolm McKibbin, Head of the Northern Ireland Civil Service, and I agreed that it was essential that we should work closely together to support the talks. NICS officials were present in the talks to advise the Executive parties, alongside NIO officials supporting the Secretary of State for Northern Ireland. Making the most of the experience of UK and NI civil servants who had worked on past talks was important. Their advice was to work towards getting all the parties in one place, and then working together on one text. But even finding the right place was not easy. In wealthier times, previous talks had enjoyed country houses or hotels. Those were either not available or affordable. Other locations were not acceptable to one or other parties. So the Northern Ireland Office decided to use its own base and offices in Belfast, at Stormont House on the Stormont Estate. Even with staff reductions, finding accommodation for five parties plus the Irish Government delegation was not easy – rooms were cleared, the canteen emptied of its tables and chairs, and staff re-located. The result was spartan, but with everyone crammed in close quarters together there was plenty of opportunity for informal contact. If the tension inside the talks was often high, civil servants worked hard to create a pleasant, relaxed, even friendly, atmosphere outside the conference room. Crucial to this were junior civil servants who had volunteered from across the Northern Ireland Office to be “floor walkers” – greeting parties on arrival, helping them get settled, keeping them informed of what was happening and encouraging them to get to meetings on time. It can sound trivial, but a welcoming helpful, friendly – but still impartial – face can help create the right atmosphere in which genuinely difficult issues can be discussed. Even with the parties all in one place, there were still issues over who should attend which meetings, and in which format. Understanding these sensitivities – and accessing some of the solutions used in the past, such as the “three strands” first suggested by Peter Brooke in 1991 – required civil servants to know the details of the devolution settlement, the parties’ positions and the talks processes of the last 30 years. Talks started on 16 October with some scepticism – one delegate said “Don’t give me a pass, I won’t be staying long”. But this early scepticism turned to deeper engagement. The Government was led by the Secretary of State for Northern Ireland who ultimately participated in more than 150 hours of talks. There was a small core team of officials who supported her in handling the talks, supported in turn by a wider group of policy officials dealing with the different issues. The arduous task of note-taking was shared out – virtually every part of the NIO played some role. The approach was to explore and understand each party’s positon on the key issues – mostly in bilateral meetings at first, between the party and the UK Government. But the parties then asked for more intense engagement – so they were invited to base themselves in Stormont House on talks days to encourage more meetings both between the parties themselves, and with the British and Irish Governments. As engagement built, the parties increasingly discussed the key issues across the table in round table meetings with all parties and one or both Governments present. Final agreement could only be achieved by the democratically- elected politicians of Northern Ireland and the UK and Irish Governments working together. Civil servants on all sides played their part in making this possible. But agreement was always going to require parties to move from restating established positions, to exploring if compromise could be found. With divisions still running deep, parties wanted to be sure that a compromise offered by one party would be matched by a reciprocal move by others. They also needed to know the overall shape of a possible agreement if they were to have the confidence to make individual compromises. The parties asked the British and Irish Governments to work together on what might be the basis for an agreement. Never easy, officials used their knowledge of the party’s positions, compromises that had been floated in earlier talks, and informal suggestions often floated in the margins, to put together a first draft heads of agreement. It pleased no-one: parties insisted on it being made clear that it had been agreed with none of them. But it became the basis for the final stage of negotiations. By this point, getting the parties into negotiations seemed easy but bringing them to agreement very difficult. As one said, “Give us a deadline, and we’ll bust it”. So the Prime Minister and Irish Taoiseach came to Belfast to join the negotiations for a hectic 18 hours. More rooms were cleared and Ministers doubled up accommodation. With sleeves rolled up, the Prime Ministers had meetings with the parties into the early hours. But they also set out the limits of what was possible – there could be a limited, focussed, financial package but it required the Northern Ireland parties first to reach agreement among themselves. Without that, the Prime Ministers left and gloom was widespread. But those with experience of previous talks had seen the parties come close to the brink of failure before, and then pull back. The credibility of devolution was at stake. Institutions that local politicians had worked hard over decades to establish could collapse. The public mood was unforgiving of another failure. So no party wanted to walk away, and all wanted to keep working to see if agreement could be forged. In the end, the final agreement came in stages. First, an agreement among the parties themselves on the welfare changes and budgetary measures they would implement. Here, Northern Ireland civil servants played a crucial part. They provided objective information and analysis to enable the parties to understand and evaluate the costs of the different options. Their work helped the parties realise they might not be so far apart after all. The final agreement implemented the UK welfare changes, but with some Northern Ireland variations paid for from the NI budget. Next, there was an emerging consensus on how to approach the sensitive issues around coming to terms with Northern Ireland’s violent past, and responding to the needs of victims and survivors. Individual words mattered, as civil servants in the NIO worked through 36 different internal drafts of heads of agreement. They had to balance the positions of all the participants and the sensitivities of victims and survivors. And they had to produce proposals which were workable, which meant working across other government departments, with legal advisers, and in close co- operation with colleagues in the Irish Government as well as the Northern Ireland civil service. Finally came a marathon 30-hour negotiating session with parties staying all night in Stormont House. Civil servants on all sides worked back and forth to translate emerging consensus into written agreement. Everyone waited, exhausted and bleary- eyed, for a final draft of the agreement, sustained by bacon butties and coffee. The Stormont House Agreement was finally concluded and announced on 23 December. It has not resolved all the issues. But it does provide a strong basis from which the devolved Executive can move forward – with an agreed budget, a focussed financial package from the UK Government, institutional reforms, and, for the first time, an agreed framework for dealing with the past. Final agreement could only be achieved by the democratically- elected politicians of Northern Ireland and the UK and Irish Governments working together. Civil servants on all sides played their part in making this possible. Their contribution – making the practical arrangements, providing objective and impartial advice, acting as trusted intermediaries – is all the more vital when political divisions run so deep. The challenge now for civil servants is to implement what the politicians have agreed.